Simple ways to care for your wellbeing before it’s too late. When I ran over Clover I knew things had to change! Have you ever had a wake up call? I was teaching full-time, had 4 children of my own, and a husband who was a 7 days a week, sometimes 24 hours a day, workaholic. I ran from one thing to another: soccer training, tennis lessons, swimming training, guitar lessons; grocery shopping, trying to put healthy meals on the table every night, pack healthy lunches every day; spend time with my own kids as well as turn up every day for my 30 Kindergarten students and give them my best. Then one hectic morning as we once again raced out the door, our Labrador puppy, Clover (named so by my daughter because he was so sweet) huddled under the back wheel of our 4 Wheel Drive unbeknownst to myself and the four kids in the car. When I had to drop my children at school and day-care all upset and crying because we had run over the dog, I knew I had to slow down! I have always been one to burn the candle at both ends. I think many teachers are like that. Slowing down has never really appealed to me and I still struggle with not trying to do too many things at once, but the results can be catastrophic (see dead puppy!). 1. Get up 15 minutes earlier to prevent the mad rush at the last minute. If nothing else, it will give you some breathing space and help you cope better with the rush or when things don’t quite go to plan. Even when I only have myself to get ready, I can end up rushing out the door forgetting my phone! 2. Prepare in advance. Have clothes ironed, lunches packed, books in the bag and sports gear ready the night before to make the morning smoother. I always find that I feel calmer and more in control when I prepare before I go to bed. Before you leave school in the afternoon, get set up for the next day so that you walk into a classroom ready for the students and you. 3. At work go outside (or into the store room!) and have some down time. 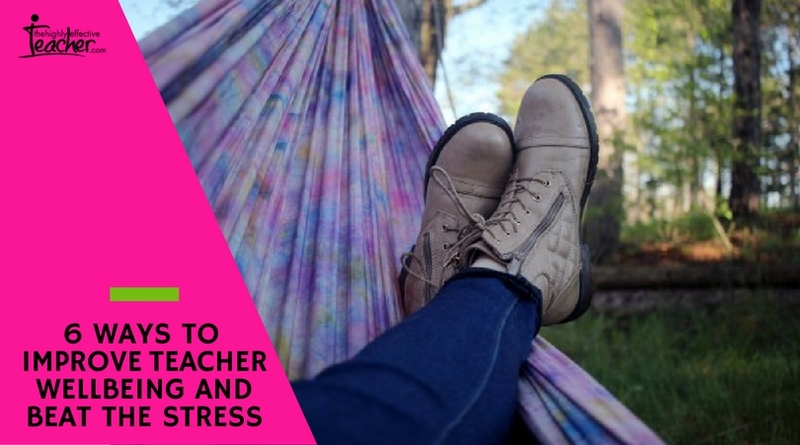 Even if you take just 5 minutes at recess or lunch to sit outside or be alone in the store room you can reset yourself to get through the afternoon. Resist the urge to fill the space with activity and just do nothing. 4. Do Now Activity. Have a quiet time in the classroom when the kids come in from recess or lunch. Set an individual task for students to do as soon as they come into the room, that gives them an opportunity to become oriented to your subject or class and gives you a chance to take a breath or check in with your ‘tricky’ students.